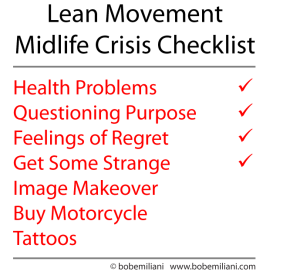 It seems to be common knowledge that the Lean movement is now suffering from a midlife crisis. Lean movement leaders are perplexed at the widespread continuing emphasis on Lean tools, narrow focus on cost cutting, and the slow uptake of the “Respect for People” principle over the last 15 years. This is the outcome, despite determined efforts to inform people otherwise. I’m not surprised. Unfortunately, we are re-living the history of the antecedent to Lean management, Scientific Management. Lean management descends directly from Scientific Management. The Toyota production system includes various tools and methods derived from industrial engineering (IE), which came from Scientific Management. Kaizen, of course, uses IE methods originally developed by Frederick Winslow Taylor and Frank Bunker Gilbreth, and improved upon by Toyota and other people. Shigeo Shingo taught IE methods to Toyota engineers beginning in the mid-1950s through the mid-1970s. IE methods are what propelled Toyota’s kaizen efforts, yet is lacking in so many organizations today. The history and evolution of Scientific Management is significant and important for us to understand if we are to avoid repeating errors made 100 years ago and avoid the same outcome — which was that certain tools of Scientific Management were subsumed into conventional management. Lean management faces the same risk — A3s, value-stream maps, 5S, and visual controls become subsumed into conventional management, and everything else falls by the wayside. Would things be better if this were the outcome? No, because material and information processing would still be batch-and-queue, management would still be zero-sum (win-lose), leadership would still be poor, employees would still be under-developed relative to their potential. History predicted our future. Frederick Winslow Taylor and the Scientific Management movement experienced the same midlife crisis 90 years ago that we are experiencing now. Despite great individual and collective efforts, they too struggled to get top managers to embrace the entire management system. They were more interested in its parts, the tools, that yielded the quick results they wanted most: cost cutting. They did not want a new win-win management system; they just wanted to slightly improve the win-lose one that they knew well and had in place for many years. The intent of Taylor’s work was to expand output in a growing economy, and do so in ways that respected workers and assured that they prospered financially from improvements. The coarse language that Taylor sometimes used to describe workers, which was common for the day (and mild compared to the racist language others used to describe workers), is widely misinterpreted as prima facie evidence of disrespect. It is not. Taylor’s 1912 testimony to Congress is the clearest explanation of his intent and the outcomes that the “Taylor system” (Scientific Management) was to meant achieve. Read it, and you will realize that Frederick Winslow Taylor was the Taiichi Ohno of his day. To not learn from Taylor is like mathematicians not learning from Isaac Newton, the inventor of calculus. Lean movement leaders, especially, must not ignore Taylor or his work. Lean is often said to be about learning. Yet there has been a steadfast reluctance to learn about Taylor and Scientific Management, and how Scientific Management leaders went about solving their problems and which problems they were unable to solve. It is apparent that most people think “we’re different.” Sound familiar? But we are not different, and there is much to learn from Taylor and his followers, including their successes and failures. In my REAL LEAN book series, I have noted how the problems that plague the Lean movement today mirror the problems that plagued Scientific Management movement a century ago. The parallels are stunning. This knowledge has been my inspiration for going about my work differently than others. It has led me to constructively criticize some people’s work (e.g. Womack and Jones), organizations, (e.g. LEI/LEA), tools (e.g. value stream maps), and activities (e.g. change management) that prevent people from creating flow. My anti-establishment writing, grounded in scholarship with the intent to illuminate and educate, has its admirers and its critics. So Lean is having a midlife crisis. It is sensing health problems, questioning its purpose, and having regrets. Will it do what people often do when they have a midlife crisis, such as spend money on expensive new toys or image makeovers, or have affairs? In recent years, the big Lean promotion businesses have been spending more on marketing and delivering their services in more flashy styles, and the once-lone entities are now in bed with one another hoping for some excitement. C’est la vie. It seems that Lean management may be on a similar life-cycle as Scientific Management, interest in which began to wane after 25 about years. If we mark the start of Lean in 1988, when the paper “The Triumph of the Lean Production System” was published, then 2013 might have been the year of peak Lean. If that is true, then we have important work to do to promote Lean management anew and help executives understand that it is far more than what they think it is. I am not giving up. I am optimistic that better times are ahead for Lean management. It will soon be seen as something that, when practiced well by leaders, can deliver benefits and outcomes that cannot be achieved by any other means. Look for the makeover soon. Indeed Lean has come to a midlife-crisis – this is also my personal view and experience. 20 years ago I got excited when I wrote a paper about Toyota and its production system, and ever since the lean approach has fascinated me, “creating more value with less resources” (letting the workforce be stable). 10 years ago the approach finally made it into the workplace at a large company where I worked at that time – I felt inspired, and lucky at the same time. All seemed to fall in place, and so I spread the word, created an online platform to pull colleagues, workers, and eventually managers towards learning more about lean on their own. … and yet it came otherwise. Interestingly enough tough questions on why a process is not doing as proposed, or planned, get the harshest headwind by the “lean experts”, who are sure that it only needs their tools and learning from a certified lean training academy to implement and things would run smoothly. In the end it is all about PEOPLE. Respecting. Humble Inquiring. Playing-together towards the best solutions side by side. This is what I am missing in today’s business still, and even more than around the time when the financial crisis hit the economy around eight years, when lean really seemed possible to implement across the organization, and the economy. Have we missed the once-in-a-lifetime chance?